Zachary H. Feldman is an associate attorney at Lallo & Feldman who concentrates his practice on Criminal Defense, Personal Injury, and Workers’ Compensation. He is a northeast Ohio native and currently lives in Lakewood. Mr. Feldman graduated from Ohio University in 2009 with a Bachelor’s Degree in Environmental Geography. He continued his legal education in 2014 at Cleveland-Marshall College of Law. 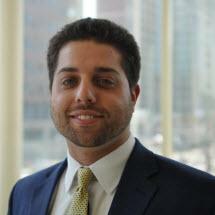 Mr. Feldman received his Juris Doctorate in 2017, and was admitted to the Ohio bar in November, 2017. Prior to his admission to the bar, Mr. Feldman served as a law clerk for Lallo & Feldman throughout his first and third years of law school, which allowed him to gain valuable training and insight from the firm’s experienced attorneys. During his second year of law school, Mr. Feldman had the opportunity to serve as a law clerk for the Geauga County Prosecutor’s Office where he had the opportunity to work on criminal, civil, and juvenile matters. Mr. Feldman is ready to bring a new energy and focus to the firm’s goal of resolving client matters efficiently and effectively.